Your voice is my song, your soul is my beat. A picture of artemis and holly. 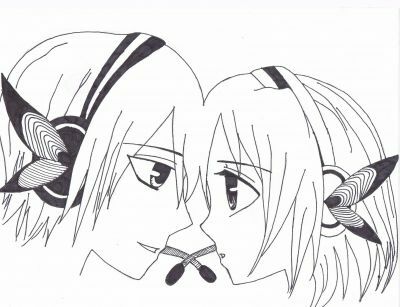 Based off of a song by vocaloids. OMIGOSH! THIS IS SO GOOD! I can never draw even close to this! Like what? Its really good!!! Nothing's wrong with it! It's perfect!! AWWWWWWWWWWWW This is adorable. A/H foreveeeeeeeeeeer! Artemis and Holly singing Magnet!? How horrifying. *takes off disguise* Holly, for the fans, we have to put on butterfly headphones and sing.